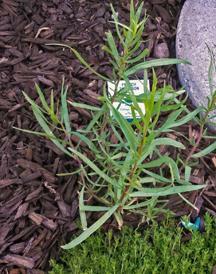 I always include a French tarragon plant in my herb garden…but very few gardener friends do. Perhaps it is out of fashion – just as Julia Child’s “Mastering the Art of French Cooking” tends to gather dust on the shelf. Tarragon is one of four fine herbes – along with parsley, chives and chervil – used in classical French cooking but can stand on its own as an aromatic flavoring for chicken, fish and egg dishes. Tarragon (Artemisia dracunculus) is difficult to grow from seed, and the seed you can find is derived from the culinary-deficient “Russian tarragon.” It is important to purchase a plant or to get a root division from a friend that is “French tarragon” (Artemisia dracunculus ‘Sativa’) if using it for culinary purposes. Although tarragon is a perennial herb, it is winter-dormant in most areas of Sonoma County. If your microclimate experiences a hard freeze, it may not recover. And, it will not survive if the area is boggy during the rainy season. But, fear not; a $1.99 4-inch transplant is easily found at your local garden shop. I never have found tarragon to present pest problems. Some gardeners may have issues with slugs and snails which can be handpicked or trapped under a board and scrapped into the trash. The only extra care I give to this herb is a light fish emulsion application (diluted with water according to the manufacturer’s direction) every six to eight weeks during the growing season. high. Because of its sprawling nature, it is attractive in a pot. While spreading slowly by rhizomes, it is easy to keep in check. It likes well-drained soil and a sunny location. Tarragon rarely flowers. But if yours does, sheer or pinch back the buds to retain the best leaf flavor. Tarragon and many other plants in my herb garden will survive with little water. But, I give my herb garden regular water during the hottest summer months so that the leaves remain succulent and aromatic for culinary purposes. It should be divided and replanted every three to four years. Tarragon can be dried, but fresh leaves have the strongest flavor. Click here for instructions to dry herbs. Fresh sprigs of tarragon can be used to infuse oil or white vinegar. Fresh chopped leaves added to butter is a tasty savory spread. Tarragon is a tender leaf. Add it at the end of the cooking process to retain its full flavor. For example, add chopped tarragon at the end of scrambling eggs or sprinkle it inside an almost set omelet. Chopped tarragon can be added to a bread crumb coating for baked fish. Sautéed onions, mushrooms and garlic are simmered with diced tomatoes – with tarragon added the last five minutes of cooking time – a delicious topping for sautéed pounded boneless chicken breasts or sautéed thin cuts of veal.